What to do with a hooked Pelican? Become a Facebook fan and join our online community! Ernest C. Simmons is a lifelong artist, painting full time for a span of over forty years. Born in Arlington Heights, Illinois, Simmons moved with his family to settle in Florida, graduating from Clearwater High School. During these formative years, his natural artistic talents began to blossom. 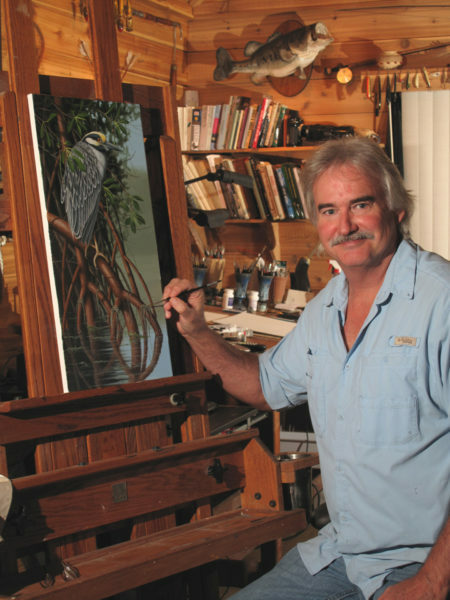 His fascination with sketching combined with a passion for photography and wildlife, especially birds of Florida, created an opportunity for his adventurous life outdoors. Simmons received no formal training. Instead, using his great eye for detail, he ventured into swamps and barrier islands to learn in nature’s classroom. There, in blinds high in trees or knee deep in lagoons, he spent thousands of hours drawing, studying and photographing wildlife and their vanishing habitats. As a wildlife rehabilitator, he acquired hands on experience and an opportunity to closely observe his subjects. He has also been face to face with man’s cruelty and irresponsibility toward animals and has a deep love and respect for all wildlife. Outdoorsman, naturalist, wildlife rehabilitator and artist are words to describe Ernest C. Simmons. He is a man who produces signature works of art based on his intimate knowledge of the laws of nature in tandem with a meticulous touch at the easel. In 1980, at age 22, Simmons reached a pivotal point in his career when his painting of the Pintail Ducks in flight was chosen the winner of the Florida Duck Stamp competition. At that time, he was the youngest artist ever to win the Duck Stamp contest open to competitors across the United States. In 1997, Simmons was chosen as Florida Ducks Unlimited artist of the year. In the year 2000, Simmons was commissioned by the Florida National Parks and Monuments Association to paint the Everglades and Dry Tortugas and Big Cypress National Parks. A few years later, he was honored as the prestigious Coastal Conservation Association (CCA) Artist of the Year. He has been published in several books, including Florida’s Fabulous Birds, Panther! and Alligators, Sharks and Panthers. His laminated field guides, posters and note cards are published and distributed by Earth Sky + Water widely throughout the United States in places such as Bass Pro Shop, gift shops and nature centers. His paintings have also adorned the covers of Tampa Bay Magazine. As a result of all of these efforts and his unique talent, Simmons has been a very highly admired exhibitor and award winner in galleries and fine art shows throughout the Southeastern United States. His limited edition catalog is widely respected and characteristic of an artist with a loyal following of collectors, including the Joy Culverhouse Collection, which includes over 60 originals, the Tom and Mary James/Raymond James Financial Art Collection, which includes over 20 originals, The James Museum in St. Petersburg, Florida and many other distinguished fine art collectors. His artwork has also raised thousands of dollars for the environment, conservation and various charities. His masterpieces range in size from award winning miniature art pieces, up to grand scale master works. 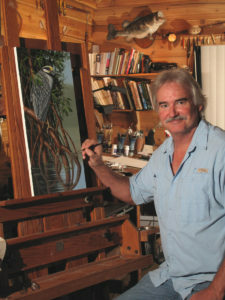 His works are currently on display at the Ernest C. Simmons Florida Wildlife Art Studio and Gallery in Dunedin, Florida. Hours are by appointment only by calling 727-738-0161.